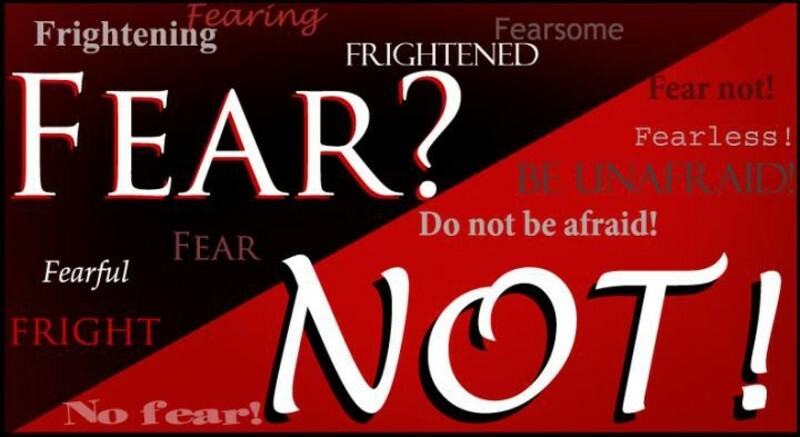 First Christian Church - SERMONS - Fear? Not! Between 1875 and 1883 there was a professional thief whose very name struck fear as he terrorized the Wells Fargo stage line. From San Francisco to New York, his name became synonymous with the danger on the frontier. He robbed 29 different stagecoach crews. Amazingly, he did it all without firing a shot. Instead, Black Bart used fear to paralyze his victims. Fear is a powerful emotion. It can immobilize us with terror and keep us from succeeding in life. Fear will steal our joy, our courage, and leave us trembling. Everyone has a fear. We may have a fear of death, of the unknown, of failure, of rejection, of sickness, of being attacked, or a host of other things. Our fears may be irrational, still we suffer from it, sometimes for a long time. King David, who wrote Psalm 27, probably knew more about fear than many of us. He was in danger most of his life, fighting wild animals, Goliath, Israel’s enemies, and hiding from King Saul, who wanted him dead. Later on, his life was threatened by his own son, Absalom. And yet through it all, he learned to overcome his fears by placing his trust in God. David declared, Psalm 27:1 The LORD is my light and my salvation--whom shall I fear? The LORD is the stronghold of my life--of whom shall I be afraid? The obvious answer is no one! Notice the way David expressed it. He did not say God will give me light, nor God will save me, nor He will give me strength. Instead, he said God is my light, He is my salvation, He is the stronghold of my life. His focus was not on WHAT God will do, but WHO He is! That’s why he can fully trust Him, which explains why David said in verse 4: One thing I ask of the LORD, this is what I seek: that I may dwell in the house of the LORD all the days of my life, to gaze upon the beauty of the LORD and to seek Him in His temple. There is just one thing David longs for – to spend time with God – to dwell in His house and fellowship with Him. This is all that is important – to know God! Sometimes in the world, people say success depends on WHO you know. Well, David KNOWS God – He communes with Him daily and therefore he is able to confidently say, "Whom shall I fear? Whom shall I be afraid?" Psalm 27:5 "For in the day of trouble He will keep me safe in His dwelling; He will hide me in the shelter of His tabernacle and set me high upon a rock." Notice the repeated reference to God’s dwelling place – dwell in the house of the Lord, seek Him in His temple, safe in His dwelling, in the shelter of His tabernacle. These are expressions of being in the place of contact with the Lord. And because of this close fellowship, David experienced God’s deliverance from fear. Do we spend time with God daily? Do we know Him? The closer we are to Him, the less we fear. Psalm 27:2-3 When evil men advance against me to devour my flesh, when my enemies and my foes attack me, they will stumble and fall. Though an army besiege me, my heart will not fear; though war break out against me, even then will I be confident. These attacks were not imaginary for David; still, he said, “my heart will not fear”. David’s confidence was not in his own strength but in God. God was his only foundation, the Rock upon which he stood. Danger was imminent. Pressure was mounting. Severe trials were ahead. David had every reason to be shaking in fear. But he was standing confidently by trusting God! Today, unemployment is high. The economy is weak. The Moslems are threatening us. Ebola has broken out. We’ve lost control of our borders and people from all over the world are invading, some with the intent of destroying us. There are riots in the streets and threats of civil war. Difficult days are here. To whom do you turn? In whom do you trust? The Government? The unbelieving world does not have an answer to these issues. They blame it on man-made global warming, whoever is in the White House, conservative Christians, anyone, but themselves. It is difficult, if not impossible, for the unsaved world to arrive at a satisfactory answer to life’s great problems which are the result of sin. Wouldn’t it be great to have a leader like Jehoshaphat, who would call the nation to fast, pray, repent, and seek God for guidance? Nevertheless, as Christians, we know God, who sits on the throne, who has the answers, and is trustworthy. Paul said, 2 Tim 1:11-12 And of this gospel I was appointed a herald and an apostle and a teacher. That is why I am suffering as I am. Yet I am not ashamed, because I know whom I have believed, and am convinced that he is able to guard what I have entrusted to him for that day. Psalm 27:6 Then my head will be exalted above the enemies who surround me; at his tabernacle will I sacrifice with shouts of joy; I will sing and make music to the LORD. Instead of focusing on what we fear, we should be singing and praising with joy because of this confidence with have in God – not just within a church building, but more so in the midst of the people. Living in fellowship with God should result in praising Him throughout the day. Let us share our faith so that others will know Him, too! In vs 7-12, we hear the prayer of a man in desperate need for help. It is passionate and determined. We should seek God’s face – not because God does not know our needs, but that He wants us to turn to Him in earnest prayers. Prayer is spiritual warfare, not to inform God of something He does not know. May the Lord help us to pray with fervency, to pray with faith without doubting, to pray with urgency, and to pray with confidence in God instead of fear. No matter what tempts us to fear, the Lord does not forget His children. Do you feel you’re suffering and no one cares, not even those closest to you? The Lord wants you to know that you are greatly loved by Him! You have nothing to fear. David ended his prayer (v 13-14) I am still confident of this: I will see the goodness of the LORD in the land of the living. Wait for the LORD; be strong and take heart and wait for the LORD. David reminds himself to wait. He knows that the trials will not suddenly leave, nor will his enemies suddenly turn around immediately after he prays. But he is confident that he will surely see the goodness of the Lord. He does not need to fear. All he needs to do is relax, be strong, praise the Lord, and wait! Courage develops during a trial, not after it is over. Let’s read Isaiah 43:1-13. From this passage, God gives us ten reasons not to fear. I. I have created you. We must remember that God created us and knows what is best for us. He created us for his pleasure. He created us for his purpose. He created us for his praise. We should not fear, because our Creator is all sufficient, to meet any need, to meet any crises. II. I have redeemed you. Redemption means that God has paid something for us. He paid for us with the blood of His Son. When Jesus died on the cross he paid the debt we owed for our sin, thus redeeming us. Hebrews 9:12 He did not enter by means of the blood of goats and calves; but he entered the Most Holy Place once for all by his own blood, having obtained eternal redemption. III. I have called you by name. He knows you by name. He knows all about you. IV. You are mine. Since He paid for us, we belong to Him. He claims us for His own. V. I will be with you. We have the promise of God’s presence. His presence alone should remove our fears. He’ll be with us, even through death. VI. I have loved you. His love is perfect. One thing we can be assured of is God’s love for us. VII. I will gather you. One day we will be gathered together. He is coming soon. VIII. I created you for my glory. God chose us to glorify Him, even through trials and suffering. The disciples rejoiced that they were counted worthy to suffer disgrace for the Name of Jesus. Our whole lives should be lived by the grace of God, for the glory of God. IX. It is the truth. The Bible is not a fairy tale. Christians are not delusional. Faith in God and His word is based on truth! FEAR NOT…you’re standing on the truth. Romans 3:3-4 What if some did not have faith? Will their lack of faith nullify God's faithfulness? Not at all! Let God be true, and every man a liar. As it is written: "So that you may be proved right when you speak and prevail when you judge." X. I am the LORD. This is the greatest reason of them all. FEAR NOT for I AM. He is Omniscient (all knowing). He is Omnipotent (all powerful). He is Omnipresent (everywhere). He is King of Kings and Lord of Lords. He is our Redeemer. He is the Creator and spoke everything into existence, and when He says the Word, everything will be destroyed. Yes, we are experiencing frightening times, but Jesus told us this would happen. Fear has gripped many and it brings torment to those who don’t know the Lord. Where there is fear, there is no faith, there is no peace, there is no joy, and there is no happiness. When we fear, we put more faith in the world’s system and the devil than in God and His Word. 2Tim 1:7 For God has not given us the spirit of fear; but of power, and of love, and of a sound mind. We need to ask ourselves where our faith is placed. Fear never helped anyone become victorious. It never helped anyone get through the circumstances of life. It is always the beginning of defeat. It always leads down the road of failure. Satan wants to control your life and mine. Every human being that has ever walked the face of this earth has taken part in this spiritual battle. Satan is a thief. God has full authority, but He allows man to have a free will. Satan has no authority, but he wants total control. We give Satan control when we succumb to fear and walk by the flesh and not by the Holy Spirit. With Jesus Christ as our Savior, we only fear God and no longer fear man, the devil, or death. 1 Corinthians 15:55-57, "Where, O death, is your victory? Where, O death, is your sting?" The sting of death is sin, and the power of sin is the law. But thanks be to God! He gives us the victory through our Lord Jesus Christ. This is good news to anyone who is in Christ, for we, too, can say, “if God is for me who can be against me.” Now is not the time for the children of God to be afraid, but to look up, for our redemption is drawing near. Now is the time to trust in the Lord with all our heart, and lean not on our own understanding, and in all our ways acknowledge Him, and let Him direct our path. We must line up our faith and our words with what God says in His Word and then we will see the victory. So, what are you acknowledging--fear and evil--or Jesus and His goodness? Let’s acknowledge and praise Jesus as our Savior, our Lord, our Redeemer, our Sanctification, our Healer, and the Supplier of all our needs! Fear will vanish when we start meditating on God’s love for us and praise Him in the midst of our need. If you have fear, you must realize, it is not from God. Rebuke fear, in the Name of Jesus, and acknowledge what God’s Word says about you, that He has given you a spirit of power, and of love, and a sound mind. That acknowledgment will unmask fear for what it really is—a lie of Satan—and bring you peace and victory. When you start to acknowledge what God’s Word has to say about a situation, then, you have set your mind on the Truth instead of lies of Satan that create fear. There is power in the Name of Jesus to dispel fear. Now, in case you are wondering what happened with Black Bart, it turns out he wasn’t anything to be afraid of either. When the hood came off, they didn’t find a blood thirsty bandit from Death Valley; they found a mild mannered pharmacist from Decatur, Illinois, Charles E. Boles. He never fired a shot, because he was afraid to carry a loaded gun. Do you have any fears? Let God open your eyes so you can see the true nature of your fear. The source of our fear is usually a trembling little demon, who fears us taking off his mask and overcoming him by our faith and the Word of God. Fear may seem overwhelming, but it is easily overcome by praising God and focusing on Jesus Christ, who has overcome the world and all its tribulations. For that reason, Jesus said be of good cheer. Fear not. Is 41:10-13 So do not fear, for I am with you; do not be dismayed, for I am your God. I will strengthen you and help you; I will uphold you with my righteous right hand. "All who rage against you will surely be ashamed and disgraced; those who oppose you will be as nothing and perish. Though you search for your enemies, you will not find them. Those who wage war against you will be as nothing at all. For I am the LORD, your God, who takes hold of your right hand and says to you, Do not fear; I will help you. Meditate on that Word, Christian, instead of what you fear. However, if you don’t know Jesus Christ as your Lord and Savior, you still have much to fear. You have the terrible expectation of spending eternity in Hell, a place of separation from God and all that is good, a place of continual torment, a place reserved for the devil and all those who reject Jesus as Lord. You can get rid of all your fears by making Jesus Lord of your life. Believe in Him for the atonement for your sin. Confess that He is the Son of the Living God. Repent of all your rebellion against God and be baptized for the forgiveness of your sin and a rebirth by the Holy Spirit. Your fears will disappear and you will have confidence in the Lord, your protector and deliverer. Give your life to Jesus and exchange— death for life—fear for peace.